Is a Datasheet a Guarantee? A note on phone scammers: My nonogenarian parents were taken for $149 and an infected computer when one of those bogus "I'm from Microsoft and your computer needs work" callers phoned. The very next day I got 5 such calls in one morning. I signed up for Nomorobo, a free service that (at least in the USA) blocks most of these execrable calls. It is working well. Recommended. A year or so ago, when I got one of these calls, I pretended to succumb, listened carefully, and pretended to type in the stuff they wanted me to do. Then I shouted "There's smoke coming from my computer - what should I do." The caller asked me to calm down. "Now there's fire coming out. What should I do? Should I save my children or toss the computer out the window." 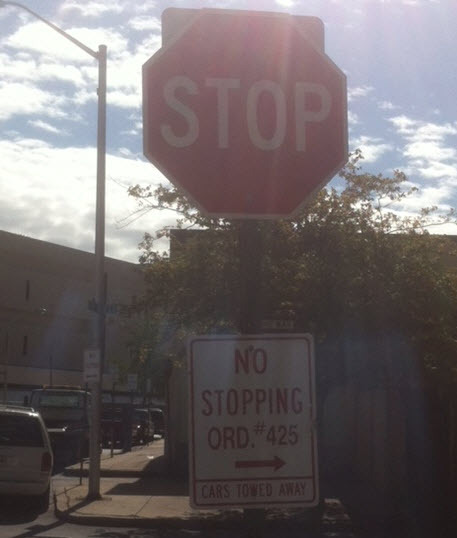 He instructed me to do the latter. Then, in a pretend panic, I said "I tossed it out, but it's in a pile of leaves and the house is burning down!" After that I was laughing too hard to continue the deception. 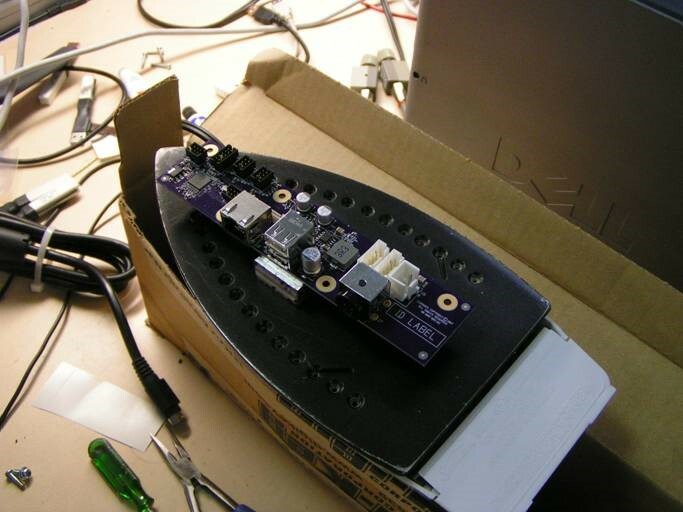 A common steam iron does a remarkably good job of reflowing small surface mount PCBs. Boards with through hole components can be spot reflowed by supporting them with aluminum blocks under the desired spots. 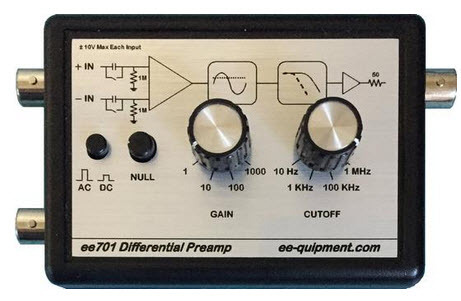 Win an ee701 differential preamp for a scope! Thanks to ee-quipment for donating the unit. A review is later in this issue. One lucky Muse reader will win this at the end of November, 2017.
re your discussion on terminology in Muse 337, these terms are standardised in the International Electrotechnical Vocabulary (IEC 60050), in particular the section on dependability. Here are the relevant definitions, with some notes omitted. Note 1 to entry: A failure of an item is an event that results in a fault of that item: see "fault"
The whole vocabulary of 20,000+ terms is available online at www.electropedia.org, with a useful search engine and equivalent terms in several languages. I worked for a medical device company that designed and built ultrasound imaging equipment. This pumps acoustic power into the patient's body using shaped waveforms and power spectra, and listens for the sound reflected from tissues and tissue boundaries inside the body. This was a few years after the disastrous Therac-25 incident (not the same company), so we were all acutely conscious, and conscientious, about patient safety. We also knew that we were subject to very stringent FDA audit for the type of medical device we were designing. 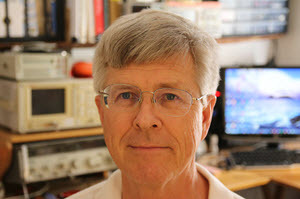 The hardware for the ultrasound device wasn't ready for testing, but the hardware engineers had a fairly good idea about the location, size, and function of the control registers for the hardware (both input and output). We knew, however, that the hardware would change, and we planned on it. This hardware included both end-user control panel inputs & outputs, and the inputs and outputs of the various beam control functions for the ultrasound beam shaping and echo detection hardware. I designed a hardware abstraction layer for the control software that had C structures specifying the location, size (i.e. 3 bits of a 16-bit memory location), and direction (big- or little-endian) for the hardware registers. The abstraction layer code (accessed via function pointers in the C structures) would read values out of the hardware registers, position them into fixed or float values as specified, and then compare the values to pre-specified upper and lower limits, throwing exceptions if outside the limits. Once the "higher level" control functions had run, new algorithm results had been derived, it was time for the hardware abstraction layer software to squish the results back down to the hardware control register representations. Again, the C structures provided the upper and lower limits, or lists of discrete, acceptable values, and tested each result against those. The conversion was done, and the results mapped into the copies of the hardware register locations. At that point, an optional "corner condition" validation function would be run that would check for prohibited combinations of outputs (where each output, in itself, was allowed, but particular combinations were prohibited), and then, once all the tests had passed, written out to the hardware memory locations. This whole process would run 40-60 times a second, but only if changes were detected on any of the inputs. * The hardware abstraction layer functions were quite small, no more than 10-20 lines of C, and comprehensible by inspection. We tested the snot out of those routines, and they were exercised hundreds of thousands of times before we had actual hardware. * The hardware engineers reviewed and signed off on the data structure specifications of the hardware registers. * We were able to complete the higher level control software well in advance of the availability of the hardware, and, with automated testing, had a very high level of confidence that it would work once the hardware was available. * Hardware changes (re-mapping of control registers, ranges, values, etc.) were accommodated without making *any* structural changes in the code. * We could (and did) write a test platform to exercise all of the high-level control software against input values within, at, and beyond the specified upper and lower ranges, or against the list of permitted values. We'd run this test automatically any time the build system detected a change anywhere in the source files. Tests had "expected pass" and "expected fail" conditions that were, themselves monitored. * When we ran the tests, we would compare outputs from previous to current runs very easily using a file compare utility, and detect any change. Detecting any discrepancy would trigger a formal incident review process. I'm happy to say that this seldom found a software bug, but fairly often found a hardware implementation problem (register size, overlap, direction, etc.) that the hardware designer had overlooked. * We could readily demonstrate to the internal and FDA auditors the limits on inputs and outputs, and that they had been checked exhaustively. * We passed every inspection. * We shortened the hardware change / software implementation & test cycle from 6 weeks to 60 minutes or less. I mentioned that each input and output was range- or permitted-value - checked. Each imaging modality had some number of higher-level control functions that made use of some of the about 80 input values. Each of the functions was characterized by which of the input values it used (a boolean "uses" or "doesn't use"), and when a cycle began, all of the input values were compared to the previous copy, and another 80-bit-long boolean was set to indicate which, if any, of the inputs had changed. This was "ANDed" with the per-function boolean, and where any bits were still set in the result, the high-level function got invoked (this was a very early implementation of Map/Reduce, without knowing the name). Then, all of the other functionality I described earlier was done. What is a vendor's responsibility to provide components that live up to the datasheet? Conversely, how should the datasheet live up to the component? I've gotten several emails recently from engineers who have discovered that various parts just do not work as advertised. This is hardly a new phenomena; I can remember in the 1970s when NEC came out with their first floppy disk controller. The datasheet was dead wrong on several registers. It's an old joke, or rather howl of despair, that so often register bits are documented inverted or transposed. Anyone who has worked in this industry for more than a short while has been burned by these problems. In the olden days parts were simple and datasheets short. It wasn't hard to fully charaterize a component. Today, even the venerable 7404 hex inverter has a 27 page datasheet! MCUs and SoCs are much more complex. A little 8-bit device can have a datasheet hundreds of pages long; those for more sophisticated devices can occupy thousands of pages. Humans are not perfect, so how can one expect perfection in the documentation? Yet, it used to be that the datasheet was a guarantee. If you used the part as documented, the company would stand behind its functionality. Datasheets are routinely incorrect. The parts themselves often have flaws; one correspondent complained that in a common 8 bit MCU one (out of a few dozen) of the instructions doesn't work correctly. The vendor's defense is that "no one uses assembly anymore, and C compilers don't emit this instruction." If a datasheet is not a guarantee, what is? Customers who discover faults can report them to the vendor, who (we'd hope) would either correct the part/documentation, or issue an errata sheet. But another common complaint is that at least some vendors never respond to requests for help. Today we're often vectored to a support forum, where much of the "support" comes from well-meaning customers. These folks may not have the company's ear. The forums are more efficient for the vendor, but often fail to satisfy customer needs. If I specify a 7404, whose datasheet claims the max tPLH is 22 ns, then I can surely expect the part, if used correctly, will never be slower than that. Shouldn't we be just as sure about the behavior of, say, every mode of an MCU's timers? What's your take on this? And I'd love to hear from vendors, anonymously or otherwise. I ran one through its paces and it behaves just as advertised. 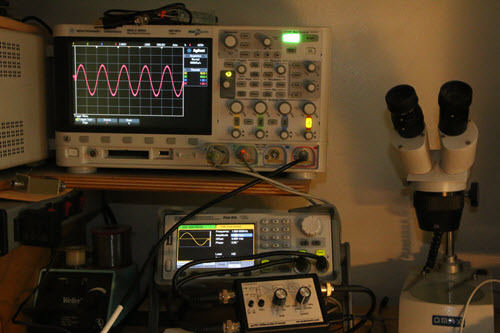 In the photo below you can see it connected to my Siglent SDG 2042X dual-channel arbitrary waveform generator. In this case the two channels drive the ee701's inputs. I've set the ARB to generate two synchronized sine waves of the same frequency. One channel is putting out 4V peak-to-peak; the other 4.010 volts. With the preamp's gain set to 1000 that 10 mV difference is huge on the scope. Further experimentation showed that cranking up the scope gain on the two input channels reduced the size of the "noise," though at no gain could I make out the 10 mV difference. 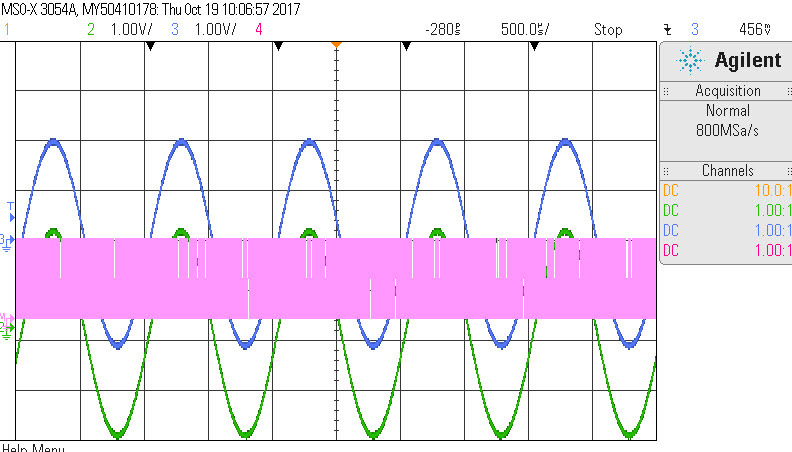 The frequency of this this signal matches the 4 GS/s scope sampling rate. This correlates fairly well with quantization error of the scope's 8 bit A/Ds. As a sanity test I set one of the ARB's channels to 4 V and the other to 5V, and the subtraction worked as expected.